Our personalised company Horseshoe trolley keyring with logo branding from Calendar Lady Promotions is a nickel plated trolley coin keyring with split ring and £1 coin with enamel logo on one side. It's popular, it's funky and it's there to gain some brand-name awareness day-by-day, week-by-week so your customers will gain great retention of this personalised trolley coin keyring. Personalise and customise with your Company branding and logo before you hand a batch of these little silent salesman, gain many more customers thanks to the subtle but effective advertising you gain from our branded Horseshoe trolley keyring with logo! 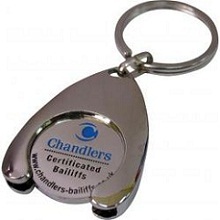 Other promotional and personalised items besides our Horseshoe trolley keyring with logo click here. To find out more about our Horseshoe trolley keyring with logo click here and fill in the contact form and we'll get straight back to you. Why not have a look at out Promotional Trolley Keyring Range?